I love interesting details in my outfits. Whether it is a detailed greek-apache hybrid print on my dress, bright nails or an unexpected gold-capped toes on my heels. Its a fun way to play with traditional silhouettes like this standard button-down shirt dress and amp it up unsuspecting colors to reflect the warmth of summer. These heels were a great find online at a Talbots sale and are–hands down–the most comfortable heels I own. I just wish I could incorporate them into office-appropriate outfits…hmm. I can’t believe its already August now, but I’m noticing that I’m trending toward wearing warmer colors for late summer and I’m anxiously awaiting the arrival of my favorite fashion season….Fall! What trends are you excited about for Fall? What is your favorite season for fashion? Thanks ladies! I love summer, but I’m so so ready for fall. I want my sweaters, tights, blazers, and boots! Love those shoes! And that is a beautiful bag too!! Thanks! Its a great clutch by Free Endearment and its become my go-to brunch bag! Me too, I’m loving the shoes! 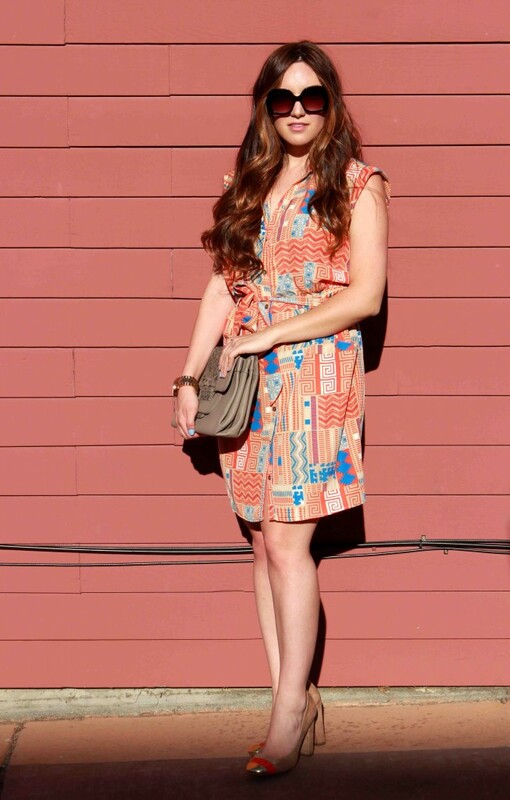 That’s such a gorgeous print on the dress, and the shoes look absolutely perfect with it! Thanks Erin! The print is a little different–its like a mix of tribal/apache/greek…but its fun! 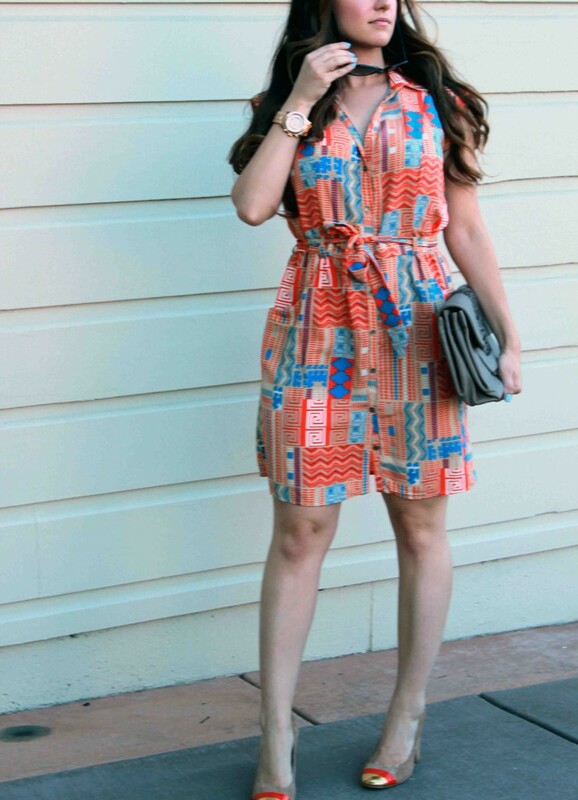 This dress is such a fun print!! Thanks Amy! I love unique pieces! I am so ready for fall. I just feel like I can’t complete my outfits because I am missing a layer. Can’t wait for boots and jackets and rich fall colours. Done with humidity! These heels are gorgeous and beyond!! I’m in love with them, forever and ever! I love your hair! It reminds me of Kate Beckinsale… maybe because I just watched Total Recall…. either way, I love it! Ooooh thanks Christine! Its all about the clipless curling rod…its changed my life! I need to check out that movie, I’ve heard good things! I am a “Talbot’s Girl”, too!